As the third element on the periodic table, Lithium is lighter and less dense than all other elements except for helium and hydrogen; it is one of three elements that can float on water (fellow alkali metals sodium and potassium being the other two). Lithium also has the highest specific heat and electrochemical potential of all elements and is the only stable light element that can produce net energy via nuclear fission. In the scope of the alkali metals, lithium possesses some of the common basic properties: it is a soft, silver-white lustrous metal that rapidly oxidizes in air to a gray tarnish and is highly reactive with water, though not as violently as the others due to the proximity of its valence electrons to its nucleus. However, it stands apart from the rest of the alkali metals in that it has the highest melting and boiling points and is the only stable one that reacts with nitrogen. Lithium has excellent thermal and electrical conductivity and has been shown to exhibit superconductivity below 400K and ferromagnetism as a gas. The element is considered both toxic and corrosive and must be handled with extreme care. Lithium was one of the first three “primordial” elements synthesized in the big bang; though present in stars, it does not occur on earth in its elemental form due to its high reactivity. Natural lithium is composed of two stable isotopes, lithium-6 (7.6%) and lithium-7 (92.4%) with extremely low binding energies; compounds of lithium are present in certain pegmatite minerals such as graphite, and its soluble ions can be found dissolved in seawater, mineral springs, clays, and brines. In 1807, Johan August Arvedson first discovered the element in a sample of petalite (LiAlSi4O10), and thus the element's name derives from lithos, Greek for “stone.” Currently, lithium is extracted via the electrolysis of molten lithium chloride and potassium chloride or lithium aluminum silicate (spodumene). One of the most well-known uses of lithium is in high-performance, rechargeable lithium-ion batteries that power electric and hybrid vehicles, and electronics, and smartphones. Energy in these batteries is generated by the movement of lithium ions from a negative anode to a positive cathode separated by an electrolyte solution of lithium salts. As opposed to disposable lithium batteries that use pure lithium metal as the cathode material, cathodes in lithium-ion batteries are composed of intercalated lithium-based compounds such as lithium cobalt oxide (LiCoO2), lithium iron phosphate (LFP), lithium manganese oxide (LMO) lithium nickel manganese cobalt oxide (NMC), lithium nickel cobalt aluminum oxide (NCA) and lithium titanate (LTO). Safety concerns about the tendency of the current crop of lithium-ion batteries to catch fire have prompted much research into alternative electrode materials that could not only eliminate the dangers of overheating but also make them more efficient, longer-lasting, and more cost effective. Experimental materials have included tin oxide, silicon nanotubes, stainless steel, tin nanocrystals, vanadium oxide, graphene, carbon nanotubes, iron nitridophosphate, polymer-coated titanium oxide, iron oxide nanoparticlefs, copper foam, lithium molybdenum chromium oxide, lithium borosilicide, and nitrogen-doped carbon-sulfur nanocomposites. Promising lithium-based alternatives to ion batteries are under development such as lithium-sulfur batteries and lithium-air batteries; researchers are also experimenting with materials for next-generation batteries that eliminate lithium entirely such as nickel colbatite, zinc-manganese oxide thin films, and organic polymers. Lithium has numerous other applications besides battery technologies. The metal’s high specific heat makes it useful in heat transfer applications, heat-resistant glass and ceramics components, and as a strengthening agent in lightweight high-performance aluminum and magnesium alloys. Compounds such as lithium chloride, lithium bromide, lithium hydroxide, and lithium peroxide are hydroscopic absorbent materials used in air purification and industrial desiccation; lithium stearate is an all-purpose, high-temperature lubricant, and other lithium compounds are also a frequent component of soaps, red colorants in fireworks, and metallurgy fluxes for welding and storage. Lithium has been used in military and defense capacities: lithium deuteride drives the reaction of the hydrogen bomb, and lithium hydrides can be used in rocket propellants. In the field of optoelectronics, non-linear crystals like lithium fluoride and lithium niobate are used for UV, visible, and IR applications such as sensors, photonic devices, optical lenses, modulators, and smartphones. Lithium niobate (LiNBO3) is notable for being a ferroelectric material with the lowest refractive index and farthest transmission in the UV range of common materials. Laboratories also employ lithium in biomedical and organic chemistry functions: organolithium reagents are frequently used to synthesize polymers, catalysts, and initiators, and though the element has no inherent biological function in the human body, lithium carbonate the main component of mood-stabilizing pharmaceuticals for the treatment of bipolar disorder. Vaporized lithium is an experimental material for shielding the walls of plasma fusion devices. Lithium is alloyed with aluminum and magnesium to form lightweight metals. It is also used in batteries, optical glasses, and in medicine. Lithium stearate is a common high temperature lubricant. Elemental or metallic forms of lithium include pellets, rod, wire and granules for evaporation source material purposes. Lithium oxides are available in powder and dense pellet forms for such uses as optical coating and thin film applications. Oxides tend to be insoluble. Lithium fluoride is another insoluble form for uses in which oxygen is undesirable such as metallurgy, chemical and physical vapor deposition and in some optical coatings. Lithium is available in soluble forms including lithium chloride, lithium nitrate, and lithium acetate. These compounds are also manufactured as solutions at specified stoichiometries. Lithium is a Block S, Group 1, Period 2 element. The number of electrons in each of Lithium's shells is 2, 1 and its electronic configuration is [He] 2s1. The lithium atom has a radius of 152.pm and its Van der Waals radius is 182.pm. In its elemental form, CAS 7439-93-2, lithium has a silvery white appearance. Lithium is a member of the alkali group of metals. It has the highest specific heat and electrochemical potential of any material, making it important in applications involving heat transfer and as the anode in batteries. Because of its high reactivity, Lithium does not occur naturally in elemental form. Lithium was first discovered by Johann Arvedson in 1807. The origin of the name Lithium comes from the Greek word lithose which means "stone". Lithium information, including technical data, safety data, high purity properties, research, applications and other useful facts are discussed below. Scientific facts such as the atomic structure, ionization energy, abundance on earth, conductivity and thermal properties are also included. Lithium is both toxic and corrosive. 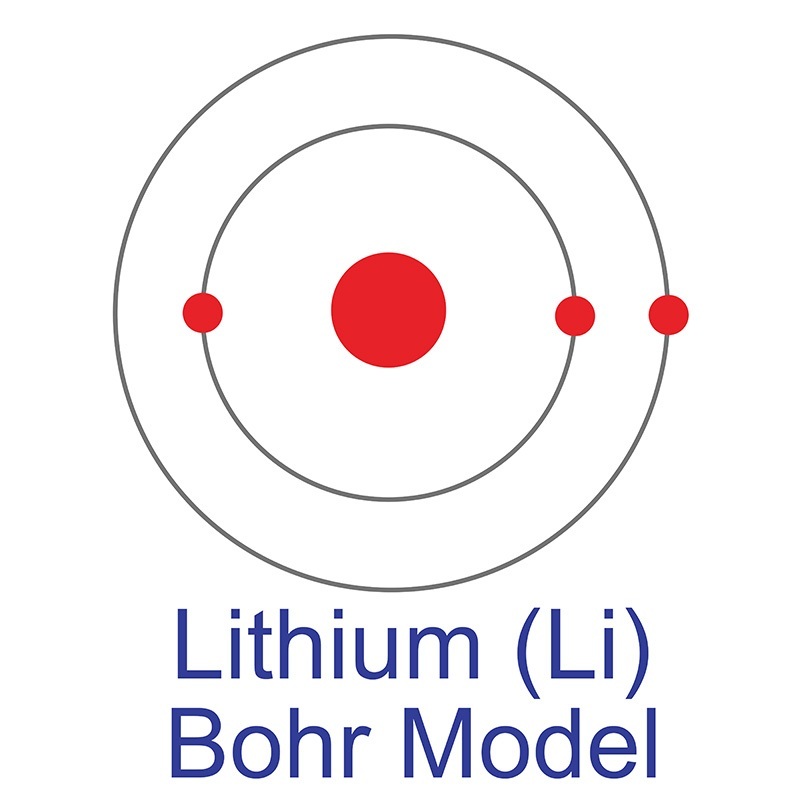 Safety data for Lithium and its compounds can vary widely depending on the form. For potential hazard information, toxicity, and road, sea and air transportation limitations, such as DOT Hazard Class, DOT Number, EU Number, NFPA Health rating and RTECS Class, please see the specific material or compound referenced in the Products tab. The below information is for elemental (metallic) lithium. Lithium (L) has two stable isotopes, lithium-6 and lithium-7. Of the two, Lithium-7 is more common making up about 92.5% of lithium atoms.